The Liberty Memorial Bridge was the first automotive bridge to span the Missouri River in North Dakota. Located on the US Hwy 10 route between Mandan and Bismarck, the bridge was dedicated in 1922 to the young men and women who served in World War I. Appropriately inscribed boulders, taken from North Dakota prairies, were placed at both ends of the bridge by the North Dakota Chapter of the American War Mothers, who also placed the plaques honoring their sons and daughters. The bridge lifts the heavy trusses of its spans 200 feet above the bottom of the lowest pier. Eight thousand rivets were driven into these trusses in the construction. The concrete approaches, girded on either side by North Dakota made brick, lead to the bridge; the one on the Bismarck side being 400 feet long but the Mandan side extends 625 feet. The main bridge deck and original approaches are 26 feet 6 inches feet wide supplemented by pedestrial walkways 4 feet 4 inches wide. The base of the eastern river pier is abouth 41 feet below normal water level and 101 feet below the roadway. The base of the western river pier is approximately 74 fee below water level and 134 feet below the road deck. The open well method was used in the pier construction. Workforce peaked at 250 with crews working day and night. Twice during the preliminary work on the bridge the construction trestle was torn out, once by ice and once by an unusually high June rise in the river level. Construction was begun in 1920 and the dedication held in 1922. This event included a three-day Mandan and Bismarck with a pageant in which 600 persons took part in the main feature. 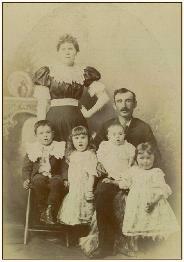 David Carey, his wife and four children arrived here in 1879. John McGinley rowed them across the Missouri River in a skiff in the middle of a heavy wind storm and they almost lost their life during the crossing. Mr. Carey had originally moved from Illinois to get work on construction of the Northern Pacific Railway bridge. Given that his family almost lost their life during their first river crossing, and he helped to build the first (rail) bridge across the Missouri in North Dakota, when the new Liberty Memorial Bridge was completed, the 86-year-old man waited for hours to be the first to cross it in an automobile, remarking "I am thankful I lived to see this day." The total cost of the $1,358,000 bridge was borne jointly by the Federal Government, the State of North Dakota and Morton and Burleigh Counties. Construction of a 4-lane replacement bridge was started in 2006 after the stone piers began to deterioate as the salt compounds used to remove the ice and snow from the bridge deck corroded the grout. The new bridge was formally dedicated on November 11, 2008. The original Liberty Memorial Bridge was demolished with explosive charges and removed in pieces from the river bed.